Cob building with Maya - • What is cob? What got me started in this line of work? 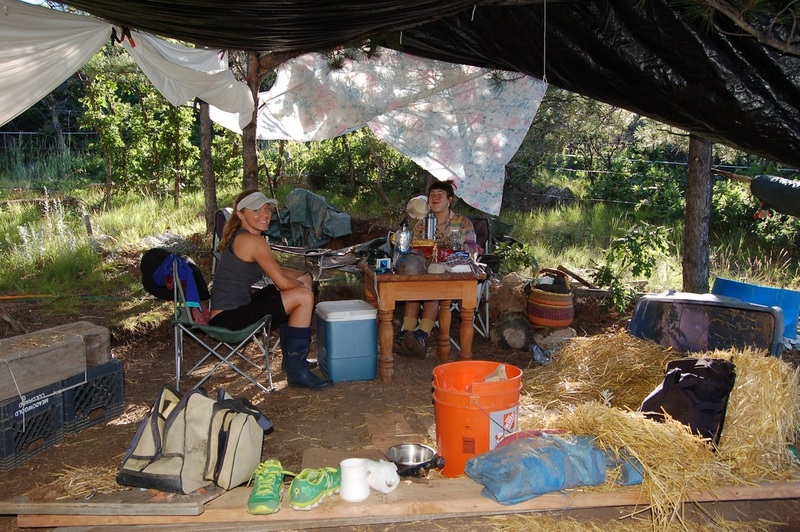 By making a building mostly solo, I hope to demonstrate that most anyone can make shelter in a way that fulfills their soul, makes their body strong, exists in harmony with nature, and does not require mortgage payments for decades of their life. Growing up on the beaches in Southern California my deepest sense of spirituality became tied to the natural world, and for years I also attended Mission San Luis Rey with its six foot thick adobe walls, frescos, massive timber rafters, paintings and statues. Later, as a young art student, I explored rituals as a means of rebuilding our collective psyches' connection to the land. As an artist I also have what I call "the design brain" which enjoys analyzing problems, in this case the synergy of locale, space, materials and the human body in order to create useful and practical solutions for living. Our world is in need of alternatives to the use of products that are over-harvested, transported long distances, processed with chemicals and purchased by contractors who construct buildings sold to people who then spend their lifetime repaying debt for shelter that oftentimes is unrelated to sunshine or the land on which it sits–buildings which are becoming more toxic. My passion is creating solutions invested with spirit, understanding, synchronicity, joy, beauty and simple functionality so that we humans can learn to live in harmony with nature. Cob is like adobe, but instead of bricks, it can be sculpted. As each new layer is added it is "woven" into the previous with a cobber's thumb, making a cohesive massive stronger wall. Why do we call it "cob"? Yes, it’s what’s left after we eat corn off of a core, but cob actually means lump. A loaf of bread made without a pan is also called a cob. At my first workshop in Oregon I generally thought I was going to study alternative building, but was introduced to the concept of natural building which also usually includes understanding of site, honoring of process as much as product, along with plenty of fun and innovation. Cob itself can be built by nearly anybody, young and old. The foundation and the roof, however, are a very important part of a building, so you'll see a number of images about this; also about using local stone. Devonshire cob houses / learning about cob. I read about cob in Natural Home Magazine. A community in Portland, OR took down their backyard fences and built a cob tea house. At top right here I can be seen at my first cob workshop, one week at HouseAlive! in Oregon in 2003. At the left are cob houses in the UK, hundreds of years old (fm Hand Scultped House book). They used to mix cob with oxen and pitchfork it onto the walls. Ianto Evans brought cob to the U.S. in the mid-90's and evolved it into "Oregon cob" (Cob Cottage Company). Bottom right is 3 yr.-old Carson using a "cobber's thumb" . Don't pound the wall to form it or it jostles the rest of the wall. Keep sides vertical and trim at days' end. Leave a spine and ribs to accept next day's cob. If a wall dries, you can spray it then paint with clay slurry just like putting handle on a clay pot. 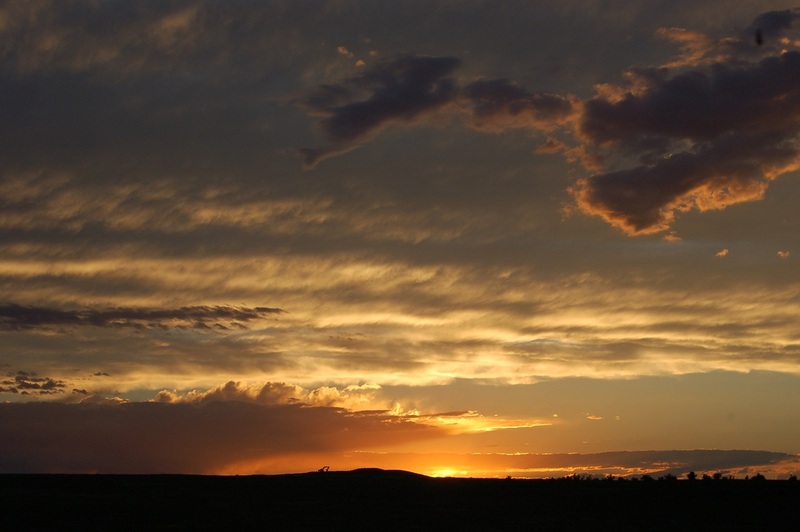 Along with using as few industrialized products as possible and learning to value process as much as product, I opt to avoid heavy equipment so the site remains as pristine as possible. It takes time and sweat equity, but time allows for learning deeply from the process and sweat...well, it's way better than the gym! Plus there's very little trash generate at natural building sites...I just dumped 3 yrs. worth...less than one curbside trash bin. I've done a few projects in the last six years listed as pages. A cob wall in front of my house was my first project in 2005. Summer 2010 a cob chicken coop was completed in town. Some other projects include: a cob mailbox, fire ring benches at the local environmental center, a bench at school, and an architectural model for a single family dwelling for an art show on sustainability. The most ambitious project by far is a 199 sq.' building on 35 rural acres, a 30 minute drive from my home in town. A rubble trench foundation was completed on site in 2009. A little timber frame shed was completed summer, 2011 and also the stone retaining wall for site with rubble trench foundation. My daughter Jen built a cob lizard bench which is part of the connected stone piers, steps and drystack walls. In 2012, I completed the stone masonry base with local stone. Summer 2013 recycled windows were purchased and several frames made for them; cobbing began around the perimeter of the building. In 2014 with the help of some family, walls continued to rise and all windows were set. In the fall of 2015 along with cobbing, I hired another natural builder to raise my roof design. In 2016 I worked mostly solo; the north wall reached the roof, electrical conduit was set in the wall and timber framework for the wrap around porch was completed. 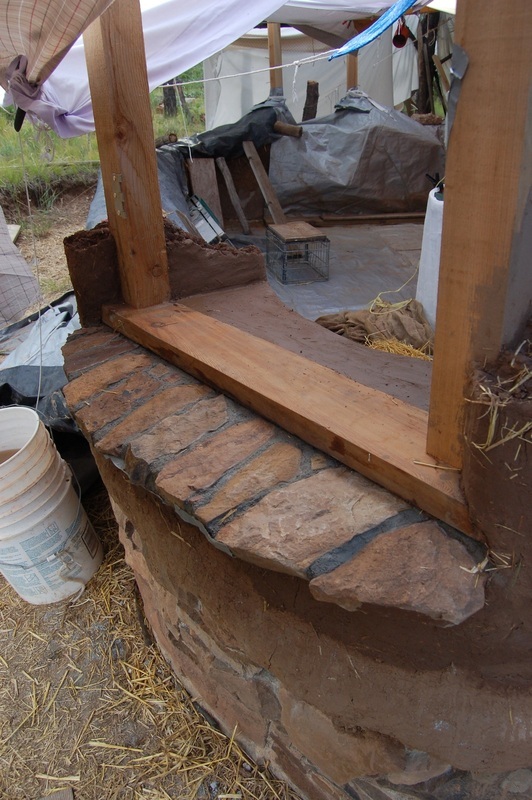 At this I am planning for the coming summer: finish all cob walls, stucco walls inside and out, roof the wrap around porch, build a rocket stove and complete the adobe floor. The building will be complete! Below: To see the full development of this project, see "ATV Shed" I - XIV above left. For some reason when I posted summer 2014 it published on all my pages. So below is 2014 for "ATV Shed"
Three guys and me and we got the girder up. "Hurricane straps" will keep the log in place along with the saddle notch. Later, there will also be anchors into the cob, all to hold the roof on in very high winds. One hurricane strap (on the big end of the log) I purchased at the hardware store and for the other two I doubled up strips I cut from recycled galvanized tin, measured beforehand, cut and drilled at home. The Girder is set! The tarps over it will protect the shade tarps (I now buy cotton canvas tarps; also king size sheets from the second hand store.) Cotton tarps serve as water catchment. These "under-tarps" will also protect the wood from rain that might get past the overlying ones (yet to be placed). The site doesn't look like much because all the stone work and cobbing done so far is covered, the cob to keep it from eroding over winter, the drystack stone because it has diatomaceous earth (microscopic sea shells/soil from the sea floor) in it to keep insects out and I don't want it to wash away, and the masonry posts to keep moisture from damaging the masonry (many freestanding stone piers have a "cap" of some sort. But the girder is UP!!! It's 24' long fyi. Up up and away! Summer building has begun! The next task was to get shade up since it makes an indescribable difference in the summertime workability & enjoyability if there is shade. As said in former posts, I've figured out king size sheets from the second hand store work well, but tarps from China disintegrate badly, some leaving thousands of particles of silver who-knows-what. There was one high quality tarp I purchased several years ago from Northern Tool to cover the site before masonry began. It was the floor inside last summer, but I cut it in strips to cover the walls last winter and alas, the name of it is lost. Last year I decided to buy a big cotton canvas tarp after Mindy gave me an old cotton canvas tent that I found to be excellent material. A 10'x16' cotton tarp is around $100 but will last much longer. This summer I bought a second. Got shade! Good friend Kate Jobgen joined us. I got workbenches set up, they undertook the task of uncovering the walls that had been covered since last fall, removing straw & burlap under tarps. We camped overnight & had a jolly good time! Before cobbing the door frame must be set as do window frames when the wall height rises a bit more. But when pouring the ATV ramp into double doors, I made the mistake of having the slope extend too far into the stem wall, depriving the door sill the base it needed to be stable over time. 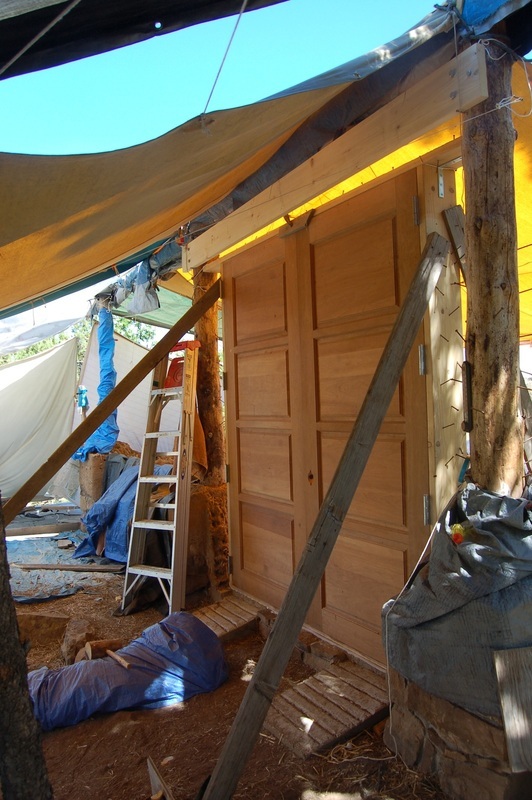 At first we put the door up, added screws to hold the cob, and put in supports to keep it plumb. But after a nearly sleepless night, I decided it needed a proper base. Danica & I went up, rocked the double door frame to the interior of the building, made some cob to use as a form on the downhill slope of the ramp, & poured concrete to offer the proper support, using a board to keep it level. Double door frame rocked back so we can fix the sill plate. Notice the two cherry doors on sawhorses in back. Concrete poured. Cob serves as form that fits right up to anything irregular. It is on the right. I can't resist posting this hilarious image. 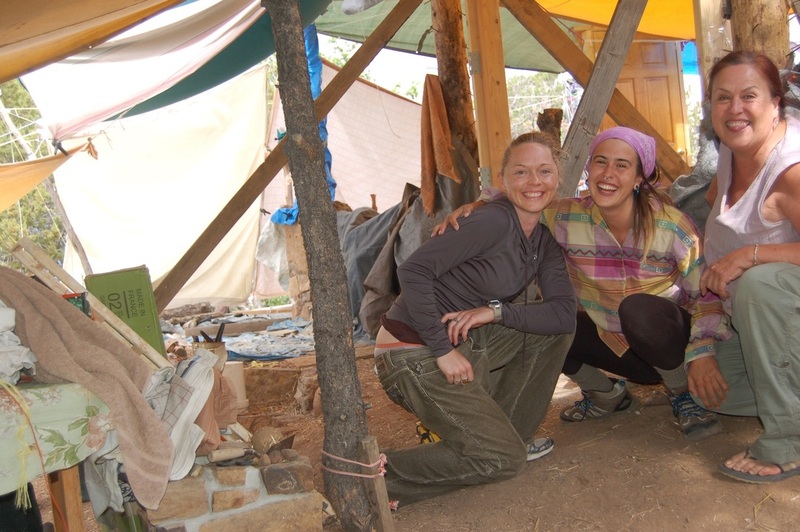 Kate could live in a bivy sac, but she works for Coleman doing marketing & was comped a "condo" tent which she decided to set up inside the building site. Redundant shelter! Next time we'll all sleep in it....except I snore....but different tents don't fix that problem do they! Friday was a New Moon and my wise sobrina suggested an earth honoring ceremony. Making shelter in harmony with Nature being my ultimate goal here, this was such a wonderful thing. On the drive up she picked wildflowers, and around the site sage and grasses. Afterwards, we raised a plank above double doorway and I put one bolt in. Thinking the bit too short, I put on my list to bring a longer bit to tomorrow. Saturday we arrived late morning ready to make some good progress. The auger bit from home didn't work well, so I used the bit I'd used yesterday but made entry portion larger to accommodate thick top of lag bolts and it worked. Lag bolts ratcheted in with socket wrench and the beam was up. Danica started making cob then she too a break to help me carry the heavy cherry doors to the frame. The first door we put into place fit pretty easily– hinges on door fitting into the hinges on frame with a little encouragement from crescent wrench to align the two. The second was more difficult. The hinges were off a bit, more at the top, but I knew it was that the frame was off of right angle (the carpenter had removed my corner braces, who knows, maybe for the better). We got the bottom one aligned and pin in with coaxing from wrench, but upper ones were still off. I used large woodclamp to pull the second one into alignment, and we finally got the top two to fit by opening the door. Success! After this, we double-checked the door frame for plumb then Danica continued making cob while I mixed mortar and set some small stones at the bottom outside so blowing snow would have to get higher to reach cob. I cobbed directly on top of my wet mortarted stone as I'd done this with success on my cob wall. After about 6" of cob, Danica took over cobbing on the West corner and I on the East side of the doors. By the time we finished it was 9 p.m. and the light had diminished too much for photos of details, but they will come. Afterthought: wooden door sill is separated from the concrete by a special foam from a roll made for this purpose. Wood in contact with concrete gets moisture that will eventually deteriorate it. Some of my mortar from stones is in contact with the bottom of the door frame, realized after all was done. Shoulda, coulda, woulda. Good job, though. One learns from the process. Note the method for holding the door frame plumb: angled planks to the ground secured at the base with heavy stones or stakes with a board between them. July 1, cobbing up around doors. Five batches of cob. North side, two window frames are set plumb and level. The contraption with a bucket is to be the top of a niche that will be a curved arch. The bucket will be for the form. The base is already made with stones and masonry. Yes, it's quite tempting to just keep working on this wall, but again, in The Hand Sculpted House, Ianto says it's best to work on the whole building at once. While it's quite impossible to make enough cob to do that and keep it all moist, I think it unwise to only work on one wall, for the weight is tremendous and I think runs the risk of breaking the concrete stem wall of the foundation. So below, you see work begin on the Western wall. Western wall, southern corner. This is rock hard dry from last summer. It is watered, then quite a lot of slip is poured on it and brushed around. And THEN!!! !....to the right, step-out window frame is cobbed into place. Danica stomped cob and I put it on the wall. Eventually I said don't even make cobs (lumps for easy deliver). Just put each batch in the wheelbarrow and straight onto the wall it went. Lovely. Danice said she likes stomping cob and I said I love building with it. We were a great team today. Detail of outer sill. Yes, the tree was left to anchor ropes that have given shade for the last few summers of working. It had begun to list & I'd anchored it to another nearby tree with heavy rope, but alas, it eventually had to be cut. The tall stump is still in use to anchor tarps. The inside of the step-out window. I worked solo the day I did this, around August 1. At first I made a cob sill as deep as the wall, but then realized it would be awkward to step out of, so I carved a step....then realized it should be deeper so made it two steps deep, then built up the sides. I made these big changes by sawing down into solid cob then horizontally, like cutting out big pieces of cake. Then moved the cob elsewhere and cobbed in it. Sorry I didn't have a camera that day. "Break Room" next to the site: shaded place for resting, having lunch and enjoying the day. Kate came down from Denver for a day again and here she is with sobrina (niece) Danica. August 6: Window is a solid pane french door. I made the frame at home on the large table constructed at the beginning of last summer. I purchased the cedar 4x4 fencing posts then, too, so they've dried out nicely in the last year in the carport. Hauled it up the hill solo on dolly. Frame assembly: I purchased a very long-shafted auger drill bit to attach to my cordless drill. The large frame of 4x4 cedar was assembled by augering two holes per corner, applying glue & hammering in oak dowels that had to be sanded a little first. August 7: Deck screws were attached to the underside, cob is put on the wall to the right height and levelled. 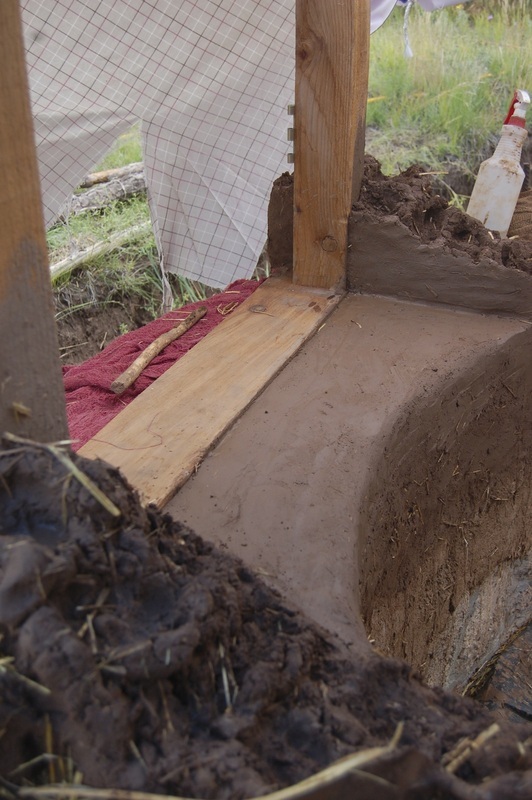 Cob is put on the window underside of the sill and it is raised into place. Boards are screwed onto the sides and the tilt is plumbed using the level. Then rocks are pushed up against the support boards to secure them in the right place. I hadn't anticipated curve hanging out from under the window sill, and in trying to figure out how to protect the cob, I'd thought tin? stone? Danica said "stone"! I realized aesthetically, she was so right. So I walked down the hill and drove 500' to my neighbors stone field, gathered about 30 stones and put them in the car, drove to my electric gate, transferred them to the wheelbarrow and brought them up the hill. They then had to be washed with a steel brush. Before I left for the day, I laid a rough sequence out on the window sill. August 8: Stones are mortared into place. I laid them out on the cob with plastic under them so they wouldn't get dirty. I folded back the plastic for two or three stones and put mortar under where they would be laid to give them a waterproof solid bed. Each stone cantilevers (hangs over) beyond the cob below, but getting mortar between them out into the overhang is difficult. It just plops to the ground. Innovation! Duct tape! Tape on underside of dry stones, brush water on stone before mortaring carefully with soft hake brush vs. spraying which might detatch the duct tape...then mortar! Duct tape will come off later. Sculpting the inside curve was so wonderful. This is what I have been waiting for and working towards for five years. Notice the masonry is covered with a wrung-out wet towel. Masonry must stay moist for at least two days to cure properly. Note also the highly textured cob on the sides of window are "spines & ribs" to make "tooth" for the next passage of cob to hold on to. Keeping cob from cracking on edges can be a challenge! ...getting tarps to be as air-tight as possible on a wide curving wall? Right! ...not easy. Potters use light plastic & it occurred to me to pin it to the cob with little staples made from baling wire. It works great! Standing in the same spot, these two images show the efficiency of the main cobbing area. Water catchment far left. Next to it a board covering a trough where clay is soaked. Sand pile (almost completely depleted) in the middle. On the right is a small table where we've begun to put cobs as we make them. They are then put in a tarp up on the porch where they can be loaded and wheel-barrowed around the building to where they are needed. Slip and buckets kept on the steps. There's a tray for cobbing tools kept under the worktable (gloves, cobbers thumbs, square-bladed trowels, sponge & spray bottles). August 10th: This has been the coolest wettest summer I've ever experienced here. The meadows, now protected from overgrazing with one line of solar-powered electric fence, are so green, water catchments are full, and there have been toads about the building site. It also means I won't drive up the roadpath, so every day we hike up with cooler, baskets and maybe the drill. Every evening, we walk back down. On her way down Danica turned around for me for the photo.